ISA claims pre-planned attack to douse Israeli motorist with tear gas, steal a vehicle is a 'crime' and not terror. Is it another cover-up? The Israel Security Agency (ISA or Shin Bet) and the Israel Police's Central District have declared a hit-and-run in Samaria a crime - not a terror attack - Tuesday, despite repeated claims by the victim's family that the accident was a car rampage. Three Arabs were arrested earlier this month in connection to the accident, which fatally wounded 63 year-old Avraham Ben-Tzion as he was standing at the Alon Intersection on December 1. The hit-and-run was intentional, however; the three admitted that they had planned to lightly hit an Israeli motorist, then spray him or her with tear gas and steal the vehicle as the driver inspected the damage. 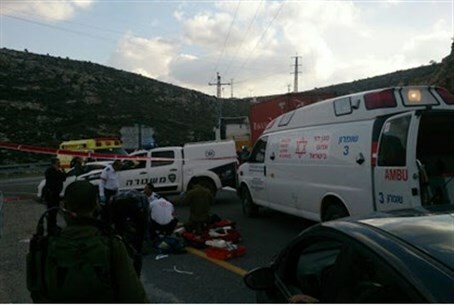 Ben-Tzion, the eventual victim, was killed unintentionally as the three made a U-turn in his vehicle. Since then, the police admitted that they have arrested more suspects in the attack, this time on charges of selling stolen parts from the vehicle. However, Ben-Tzion's family has been outspoken against the quiet handling given to the attack, which they have repeatedly accused the Israel Police of covering up. "It's over like that just because he was a Jew," Ben-Tzion's daughter Revital stated to IDF Radio Tuesday afternoon. "There is no evidence to provide that it was just a robbery; if was just a carjacking, he would still be alive." "We do not accept these conclusions," she added. "Magen David Adom officials said he was hit with a blunt instrument. Eventually, he was beaten to death. If they just wanted to take the car, they could have just taken it and driven away." Revital added that her family has faced a difficult series of emotions following the announcement. "It's a feeling of turning one's back, that this common," she said. "This event wasn't even in the headlines. There is a sense that there may be systemic considerations not related to our story, regarding the security situation." The remarks echo statements Revital made earlier this month. "He was brutally assaulted and suffered severe head injuries and a fractured skull," she said shortly after the attack. "At present they say this is a criminal attack but we view this as a terror attack. We cannot believe that they can declare this a criminal act [and] it is clear to us that this is a terror attack." "People who want to steal a car, steal it and drive away," she noted. Frustration against the security establishment has peaked after several incidents, including the attempted murder of Temple Mount rights activist Yehuda Glick, the murders of 27-year-old construction worker Netanel Arami hy"d and 19-year-old Shelly Dadon hy"d were played down by the Israel Police and Internal Security Ministry.